Bipitone gives accurate and consistent blood pressure readings that conform to values obtained by standard mercury sphygmomanometers. Blood pressure measurement is extremely simple using BIPITONE. No stethoscope is required and human errors in auscultation is eliminated. The method used is an electronic adaption of RIVA-ROCCI principle. Special cuff with multiple sensors cover a wide pick-up area to determine the blood pressure easily. BIPITONE is useful to doctors as well as for hypertensive patients to keep a regular check of their blood pressure at home. Wrap the velcro cuff on the arm; and inflate bladder as usual. Press B.P. ON switch and gradually deflate cuff pressure at rate of 2 to3 mm/Hg. 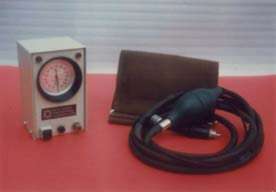 When the Systolic pressure is reached , the electronic beeper and the red LED flashes on the B.P.meter will start. As cuff pressure is further reduced, the beeps/flashes will stop to indicate the Diastolic pressure. Size/Weight: 4 x 3 x 1 ½ inches / 500 gms.